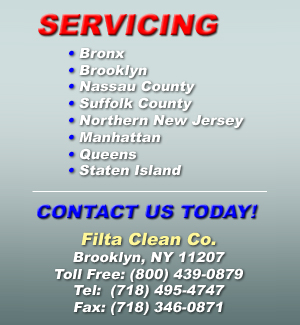 The Filta Clean Company is a highly trusted provider of exhaust hood and grease trap cleaning services with over 50 years of experience throughout the 5 boroughs of New York City plus Long Island (Nassau County & Suffolk County) and northern New Jersey (Hudson County & Bergen County). Our main focus has always been keeping restaurants and commercial kitchens in compliance with all NYC, NJ, Nassau County and Suffolk County fire, health and building codes. At the same time, it is our priority to leave you, our customer, with a spotless kitchen and clog-free grease traps. We also provide our service to schools, nursing homes, hospitals and any commercial cooking establishment. There is only one way to know your kitchen grease hoods, traps, ducts and drains are truly clean—call Filta Clean and enlist the services of our trained technicians. Filta Clean Company is a leader in commercial kitchen and restaurant cleaning services. With the quality of our grease trap cleaning, exhaust hood cleaning and other services we look forward to continuing to grow. Our commitment to building quality, long-term relationships with our clients is the cornerstone of our success. Our services include cleaning and installation of grease hoods, ducts, fans, grease filters, grease traps, air or charcoal precipitator filters, air conditioning ducts, heating ducts, laundry ducts and garbage chutes. Also look to us when you need cooking oil picked up, precipitator and charcoal filter service, installation of access panels, installation of fire doors, lint duct cleaning, and grease filter or air filter sales. The Filta Clean Co. | 107 Georgia Ave., Brooklyn, NY 11207 | Tel: 718-495-4747 Fax: 718-346-0871 | Copyright © 2010 All Rights Reserved.